A super easy and creative pasta dish with the light and fresh flavors of summer. 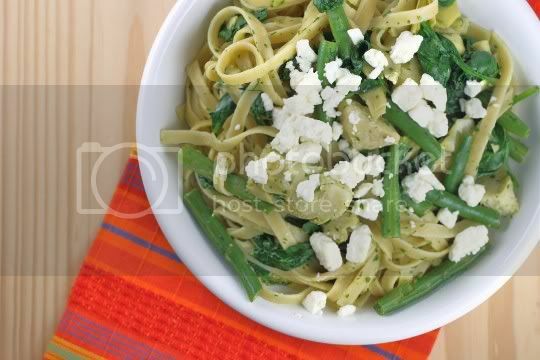 Although this is nothing more than pasta and veggies, the addition of salty feta, tangy lemon, and a unique twist on pesto makes this quite an interesting meal. Start by making the pesto, which in this case consists of parsley, dill, garlic, and olive oil. It's super fragrant and sweet, a little pungent and tangy. While you're doing this, saute the artichoke hearts until slightly browned on the edges. 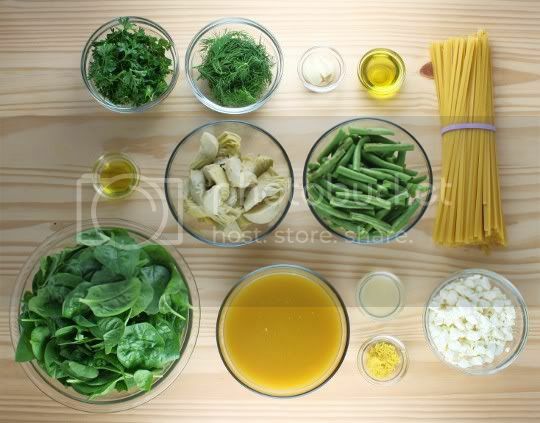 Next, cook the green beans in boiling water, and add the pasta to the same water after they're done. I love this technique: 1) you aren't wasting a whole pot of water just to start fresh with a new one, 2) it's super efficient, and 3) any green beans vitamins and nutrients get cooked right back into the pasta. What a brilliant idea! 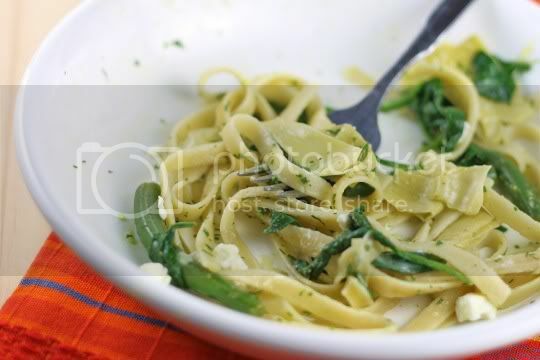 Finally, add the drained pasta, spinach, artichokes, green beans, and lemon juice and zest to the pot. Add vegetable broth to add some moisture to the mixture, then add in the parsley pesto and stir well until everything is coated in bits of green. Season to taste with pepper (salt really isn't needed thanks to the lemon), and top with crumbled feta cheese. I think this is best served the same day, and at room temperature or even slightly chilled like a pasta salad. In fact, orzo would be a great substitute for the pasta to make a springtime, potluck-friendly dish. The pasta is perfectly moist from the added broth, and the veggies are crisp-tender. 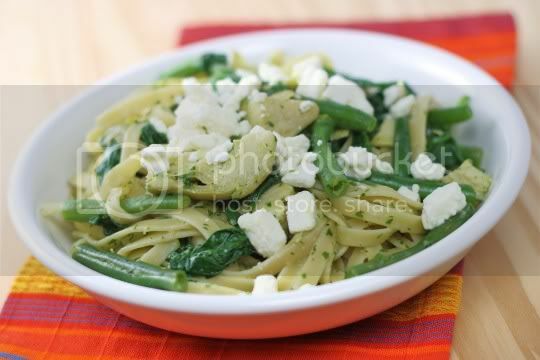 The green beans add a bit of sweetness, while the artichokes and feta add a nice saltiness. There's not a TON of lemon flavor, and I think the olive oil in the pesto mixture gives the dish a slight buttery undertone. The parsley definitely stands out, providing a light and herbal taste that would go great with some crispy, buttery, garlicky bread on the side. Make again? Possibly, with some adjustments (using orzo or a smaller pasta shape). Subbing the green beans out with broccoli might also be good. Vegan variation: Omit feta, or use a vegan variation (nutritional yeast would be delicious on top!). I think this sounds like a lovely dish. I think pastas can be a bit too heavy sometimes - but I can imagine making this one for a nice summery Sunday lunch. Can't wait to try it! This looks like it could be my new favorite dish! All things I love. We just launched the all new seasonalpotluck.com and March is artichoke month (winding down) I'd love if you'd link up this recipe http://bit.ly/zRfNjo In April we'll be featuring Peas and Rhubarb, so if you have any great recipes that use those ingredients, we'd love if you'd link them up as well!